Dispute Between Neighbors. A True Story. One of my goals in life is to some day own a house surrounded by land, and far enough away from neighbors so I can’t hear their toilet flush or clearly hear family spats. Have I ever mentioned that I live next door to a couple who likes to fight either first thing in the morning or right before midnight? When I heard the following story and saw the pictures of the feuding neighbors in Utah, I laughed. But then it occurred to me that I too would be pretty darn pissed if I bought my dream home and my neighbor pulled a similar stunt. A city councilman in Utah, Mark Easton, had a beautiful view of the East Mountains, until a new neighbor purchased the lot below his house and built a new home. The new home was 18 inches higher than the ordinances would allow, so Mark Easton, mad about his lost view, went to the city to make sure they enforced the lower roof line ordinance. The new neighbor had to drop the roof line, at great expense. Recently, Mark Easton called the city, and informed them that his new neighbor had installed some vents on the side of his home. Mark didn’t like the look of these vents and asked the city to investigate. previous post: And You Thought YOU Received Bad Customer Service. Ha! Serves him right. Props to Mr. Easton’s neighbor. As if the 18 inches made a huge difference…. I agree that it serves him right. If you do not want a house built there, buy the lot. 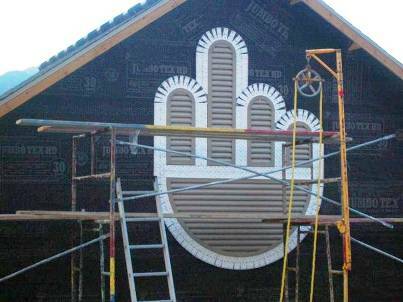 I only wish i could do this to my house for my lovely *** Neighbors! Well, that’s creative. And it’s what you get when you try to usurp someone else’s rights. Perhaps Mr. Easton chose the wrong lot. 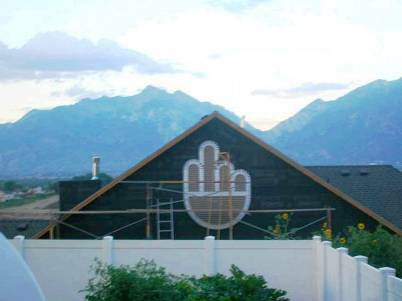 His neighbor seems to have a better view of the mountains than *he* does! He should have bought the other lot if he didn’t want his view hampered. Hello!!! The neighbor was in violation of the ordinances he agreed to when he bought the property. Most people, including those who commented above, are clueless regarding ordinances and covenants and think they can do whatever they please. The neighbor seems to be tastless jerks. I’m sure Easton complained as it was going up, and the neighbor ignored him. What a jerk of a neighbor. Good luck when he tries to sell. That is hilarious! The neighbor complaining about 18 inches needs to get a life! Serves them right!! Perhaps Mr. Easton should offer to help the new neighbor on the additional cost to drop the roof line. Would it be a neighborly thing to do to further improve his view? I would call that creative venting work. 18″…WTF it’s wrong with this guy? does owns the neighbourhood or is he 18″ short himself to look at mountains, grab a chair ,Mate. The neighbor was in the wrong. If the city says that your roof line can only be so high and you go ahead and build your roof line higher than what is allowed, then you are responsible for making sure that you fall within those guidelines. Had something similar happen to me. Neighbor built a wall right on the property line. Ugly wall too…not a pretty one. This wall was preventing water from draining from my yard into the drainage ditch because he went 1 foot further than what he was supposed to. Six months, numerous complaints from us, letters from the city, and three floods later (caused property damage in my house) he finally came out and cut the cinder blocks back. The cities make these ordinances for a reason. Sometimes it isn’t just for the view. 51 queries in 0.626 seconds.